Global Power Law & Policy | Legal and policy developments affecting the global power industry. Legal and Policy Developments Affecting the Global Power Industry. On June 1, 2019 the Pilgrim nuclear plant in Massachusetts will shut down, a victim of rising costs and a technology that is struggling to remain economically viable in the United States. But the electricity generated by the aging nuclear station soon will be replaced by another carbon-free source: a fleet of 84 offshore wind turbines rising nearly 650 feet above the ocean’s surface. In this article from Wired, K&L Gates partner and Practice Group Coordinator for power David Hattery discusses how in recent years, wind turbines and their technologies have become more palatable, and therefore are more accessible, to communities. Because of this, turbines are able to generate more power than ever. As a courtesy to our clients and friends, the K&L Gates Power practice has updated the Energy Storage Handbook. This Energy Storage Handbook (Handbook) is designed to be a basic primer on what energy storage is, how it is regulated by federal and state governments, and what sorts of issues are encountered when such projects are financed and developed. While this Handbook is not meant to be a definitive catalog of every energy storage law and issue existing in today’s marketplace, we have endeavored to highlight the most common regulatory and development issues faced by our clients and the industries that we serve. We anticipate continuing to update this Handbook as additional states and stakeholders continue to address the implementation of energy storage resources in the marketplace. We hope you find it useful and welcome your feedback. K&L Gates welcomes you to join us at #ESACon19. We are excited to be the News Desk Sponsor at this year’s conference. The conference will be held on April 16-18, 2019 at the Phoenix Convention Center in Phoenix, AZ. Stop by Booth 526 to meet the team and pick up a copy of the newly released Fourth Edition of our very popular K&L Gates Energy Storage Handbook. Join us at the ESA News Desk where we will be conducting interviews with executives from several companies. Portland Partner Bill Holmes will be a panelist during, “Advanced Contracting in Energy Storage (ACES) Workshop,” where he will present on energy storage project development. The workshop will be held Tuesday, April 16 from 9:00 a.m. – 11:00 a.m. in North 124. Bill will also give a Master Level with Kris Zadlo, Senior Vice President of Invenergy, entitled “Ins and Outs of Energy Storage Agreements,” which will discuss features and pitfalls of long-term energy storage agreements. It will be held on Wednesday, April 17 from 11:30 a.m. – 12:30 p.m. in North 122. We look forward to seeing you in Phoenix! To view more information on these topics in Volume 42 of The Energizer, click here. K&L Gates is pleased to announce that the Blockchain Energizer has returned from a period of rest and reflection! 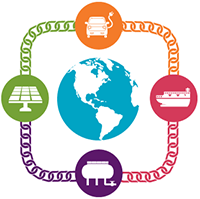 Recognizing the variety of important emerging technological innovations and structural changes affecting energy markets, we have decided to expand our focus beyond Blockchain to include distributed energy resources, microgrids, and other emerging energy trends — all the technological innovations driving toward a more efficient, more reliable energy system. To reflect our broader scope, the Blockchain Energizer will be now known as The Energizer. We have expanded the team to include additional K&L Gates attorneys tracking these important developments. The Energizer will still be published about twice a month and the subscription is the same. We appreciate your support and have enjoyed hearing from the many readers who rely on the Energizer for a periodic dose of energy tech! We look forward to continuing to provide timely coverage of increasingly important developments. Growing Blockchain Interest in the Oil and Gas Industry. California Mudslides Prompt Push for Montecito Community Microgrid Initiative. New Rules in EV Charging in Pennsylvania. To view more information on these topics in Volume 40 of The Energizer, click here. K&L Gates welcomes you to join us at #ESACon19. We are excited to have the opportunity to meet with you at this renowned conference and expo. The conference will be held on April 16-18, 2019 at the Phoenix Convention Center in Phoenix, AZ.